It was April 1. Incoming orders were tinged with suspicions of the day. To the north other divisions were exploiting their Rhine crossings and knifing into cancerous Germany. And now veteran infantrymen of the 36th were being handed their first rear area assignment, occupation of the Palatinate. General Patton shook loose his Third Army until it was reported only 90 miles from a Russian-American junction. GI observers predicted that after 19 battle-crammed months, the 36th would not be in on the final kill. Kaiserlautern civilians pause to read latest regulations posted by the Allied military government. The Division took over the Kaiserslautern-Zweibrucken area. Units were spread thinly to blanket wide areas, battalions of the same regiment sometimes 25 miles apart. Motorized patrols wound about through the many villages covering the intervening distances. Check points were established to keep German travel at a minimum and patrols went about collaring German soldiers who had discarded their uniforms for civilian attire. Screening was exercised to the fullest extent, uncovering tremendous amounts of enemy materiel and ammunition. 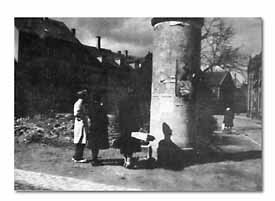 In Kaiserslautern and in Ludwigshaven and Worms, also occupied by Division troops, Allied bombings had left blocks of the industrial areas little more than heaps of rubble. Morale zoomed. Few could deny that this was a more pleasant way to wage war. Troops were billeted in spotless German houses, and though fraternization was still forbidden, spring sports were popular and shows more frequent. Mickey Rooney toured the area with his "Jeep Company," and Marlene Dietrich returned to the 36th for her second visit. But when the dull drudgery of training cut in on the fun, some were heard to clamor for a return to the line.